Green tea, the unfermented leaves of Camellia sinensis, retains much of the color of the plant's leaves, while black tea, derived from fermentation of tea leaves, takes on a darker color. Dozens of countries produce tea; however, most green tea production remains in China and Japan, where tea drinking originated. Science has revealed a variety of health benefits of green tea, including some potential benefits for prevention of blood clot formation associated with cardiovascular disease. Green tea extract inhibited oxidation of lipids and exerted a blood thinning effect in a laboratory animal study published in the July 2004 issue of the "Journal of Agricultural and Food Chemistry." In the study, green tea inhibited oxidation of the essential fatty acids arachidonic acid and linoleic acid. When green tea was combined with red blood cells, blood flow improved and showed a thinner consistency. The study was conducted at the Department of Food Science, National Taiwan Ocean University, Keelung, Taiwan. Scientists at the Department of Chemistry, University of Scranton, Pennsylvania demonstrated that long-term consumption of green tea showed anti-clotting activity by decreasing levels of fibrinogen -- a protein component of blood clots. The laboratory animal study also showed that green tea decreased atherosclerosis, a process that encourages blood clot formation. Additionally, antioxidant effects of green tea decreased oxidation of lipids, which also contributes to development of blood clots. The study was published in the June 2004 issue of the "Journal of Agricultural and Food Chemistry." Green tea antioxidants, known as catechins, decrease platelet aggregation, according to a study conducted at the College of Pharmacy, Chungbuk National University, Cheongju, Korea. In the laboratory animal study, green tea catechins and epigallocatechin gallate, EGCG, one of the major catechins, prevented pulmonary thrombosis -- a potentially fatal condition in which a blood clot lodges in the lungs -- and prolonged bleeding time, indicating a blood thinning effect. 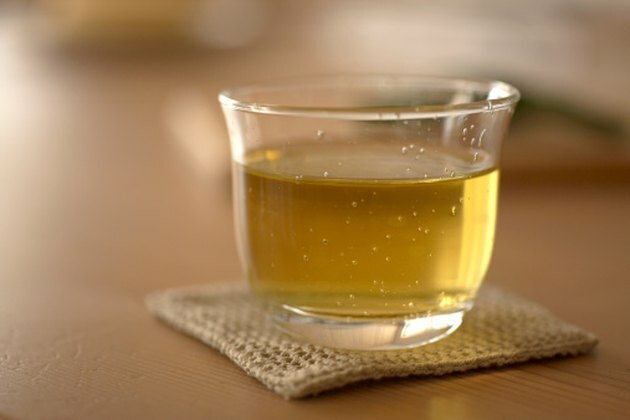 In a tissue culture portion of the same study, green tea catechins decreased aggregation of human platelets, but did not alter coagulation, indicating that green tea's anti-clotting activity may be due to its ability to prevent platelets from sticking. The study appeared in the November 1999 issue of the journal "Thrombosis Research." Green tea is included in a list by Mayo Clinic's Sheldon Sheps, M.D., of foods to avoid while taking the blood thinning medication warfarin due to its high content of vitamin K, which has blood clotting effects that may counteract the blood thinning effects of warfarin. The average daily allowance of vitamin K for men is 120 mcg and for women 90 mcg. On the contrary, information provided by St. Luke's Family Practice indicates that brewed green tea contains negligible amounts of vitamin K. Consult your doctor to determine if green tea is appropriate for your health situation.